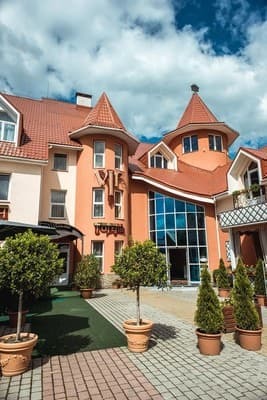 The hotel and restaurant complex "V & P Resort" is located in the heart of the city of Khust, just 2 km from the railway station. 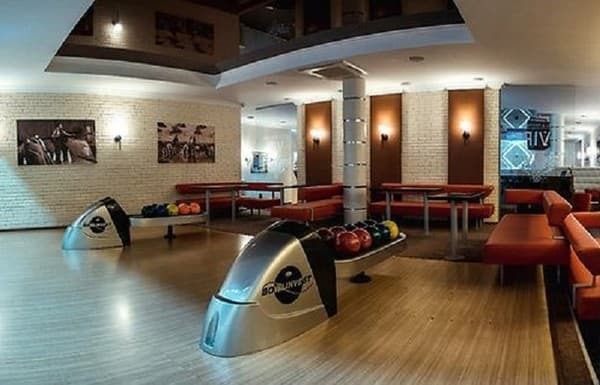 The hotel has 20 comfortable rooms of different categories - "standard", "superior", "junior suite" and "suite". 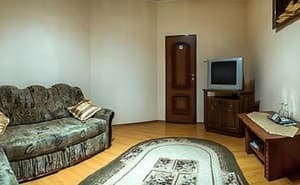 Each room of the hotel "VIP" is equipped with comfortable furniture, air conditioning, TV, free Wi-Fi, private bathroom and a bathroom. The restaurant of the hotel "V & P Resort" is decorated in a country style. Here guests are offered dishes of Ukrainian, Hungarian and European cuisine. 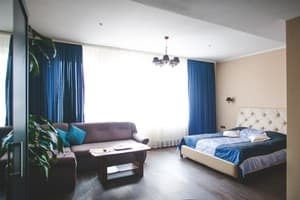 Description of the room: Bright one-room with two separate beds. Description of the room: Classic double room with double bed. 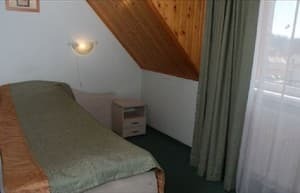 Description of the room: Classic Triple Room with 3 single beds. 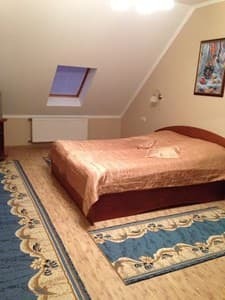 Description of the room: Large double room with a double bed and a sofa bed. Description of the room: The two-room suite is equipped with a comfortable double bed and a sofa bed. Гостинница находится в центре города Хуст. Проживали мы в 2-местном номере эконом класса. Огромный светлый номер, есть тумбочки для вещей, телевизор, доступ к интернету, туалетная комната с душевой кабиной. Не хватает при таком жарком лете кондиционера и небольшого холодильничка. А в общем всё очень пристойно. И ещё - хороший, вежливый персонал сделал наше пребывание в городе ещё приятней. Кстати очень радует наличие ресторана в отеле. Цены достаточно приемлемые, хорошая кухня и приятное обслуживание. Вообще в отеле есть много всяких развлечений: сауна, боулинг и т.д. Рекомендуем всем, кто едет в Хуст останавливаться в этой гостиннице. The cost of additional space for an adult is from 120 UAH, for a child - from 70 UAH. 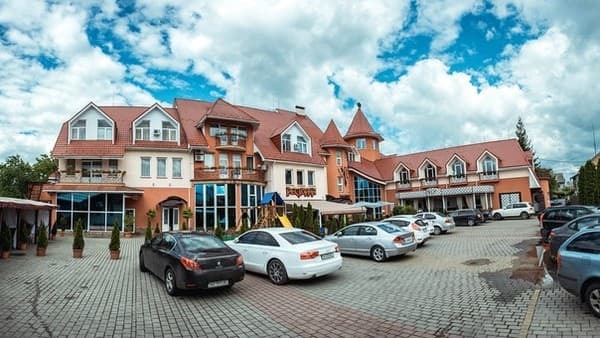 On the territory of the hotel there is a restaurant, where you can taste dishes of Ukrainian, Hungarian and Transcarpathian cuisines. 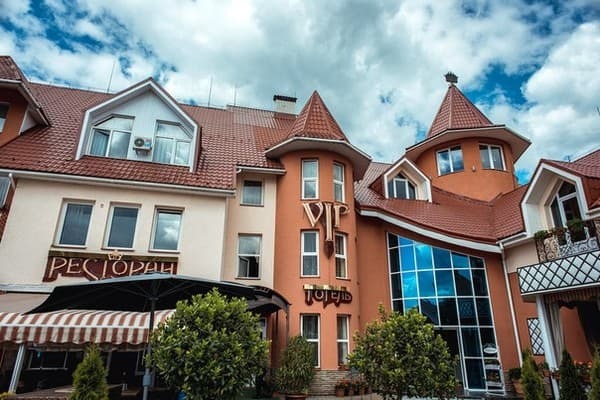 The hotel and restaurant complex "V & P Resort" is located in the heart of the city of Khust, just 2 km from the railway station. The distance to the city of Mukachevo is 60 km, to the healing springs of Shayan - 15 km.